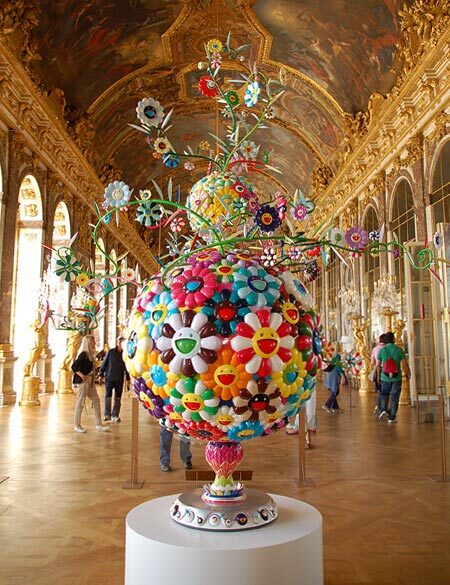 Any body that is interested in the contemporary Pop Art masters like Jeff Koons or Takashi Murakami, will no doubt have come across the protests and commotion surrounding the contemporary art programme at the Palace of Versailles. Jean-Jacques Aillagon has long been a supporter of contemporary art, and has shown his support by staging exhibitions of some of the worlds most cutting edge artists within the grounds and palace rooms at Versaille. Perhaps two of the most controversial of those have been the Jeff Koons exhibition in 2008/2009 and the current Takashi Murakami exhibition. Each of these exhibitions has seen the display or artwork throughout the Royal Apartments and the gardens of Versailles, provoking objections that accuse Versailles of bowing to "Disneyfication" or to artists who merely act as parasites on the art of the past in order to make a quick buck. 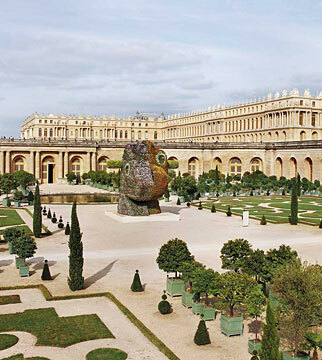 In particular, two French groups, the Coordination Defense de Versailles and Versailles Mon Amour (VMA) have had two petitions signed by over 12,000 people in protest of Murakami being allowed to show at the Palace which formerly housed Louis XIV and his entourage. Despite the cries of sacrilege, I think that these types of exhibitions are great, and break down some of the barriers that keep people from exposing themselves to either the arts of the past, or modern and contemporary art. Also, who can say that there isn't a healthy does of fun and lightheartedness about these shows. Isn't the art experience supposed to be an enjoyable one? Especially where Koons or Murakami are concerned? Who could fail to be amused by the sight of Koons 2000 work "Split Rocker", peering out over the gardens, or smile at the juxtaposition of Murakami's "Flower of Matango" in the Hall of Mirrors? Call me weak, but I certainly can't help myself, and I think Murakami knows just what he is doing if his official press statement is anything to go by: "I am the Cheshire Cat who greets Alice in Wonderland with his devilish grin, and chatters on as she wanders around the chateau."